Inviting people to a topic is a great way to increase visibility to not only other members but to people outside the forum. To invite people to a topic goto the topic controls -> Share -> Send an invite. From here you can enter either a username or a email address. At TL2 you gain the ability to edit wiki pages. A wiki page is a topic that can be edited by anyone with TL2+ permissions. Wiki pages a great for when you want multiple people collaborating on a topic without the hassle of only having 1 editor. To edit a wiki post all you do is click the edit wiki button. It will popup a standard text editor. Discouse DOES NOT handle multiple people attempting to edit and save a topic so keep this in mind when attempting to get multiple people together on a single topic. There are two ways of making a group PM. Either by inviting extra people to a already existing PM or by starting a PM with additional users. 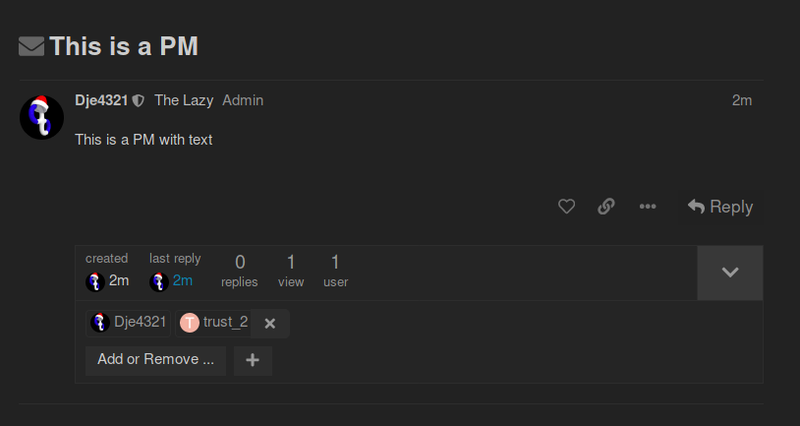 To add additional users to a PM you click “Add or remove…” at the top of the PM and from there you can invite people like you would normally. You can also remove people by clicking the X next to their name. You can reply as a linked topic if you want to continue discussion on something without derailing a thread. This allows the original thread to remain on track while still allowing for discussion about a specific topic. To reply as a linked topic just hit reply to a post and click the arrow at the top left. Select “Reply as a linked topic”. 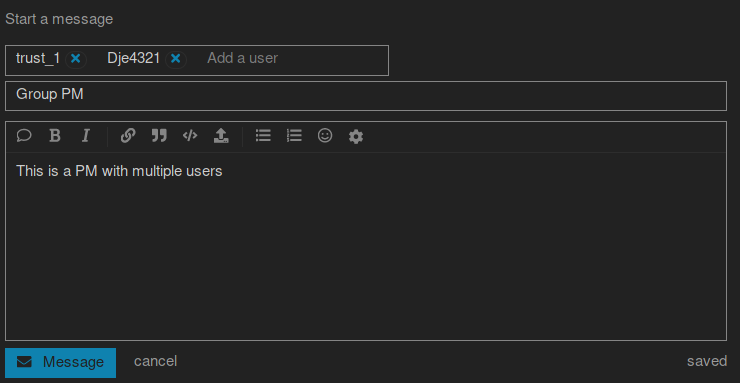 This will open a create topic editor with a link back to the original thread.